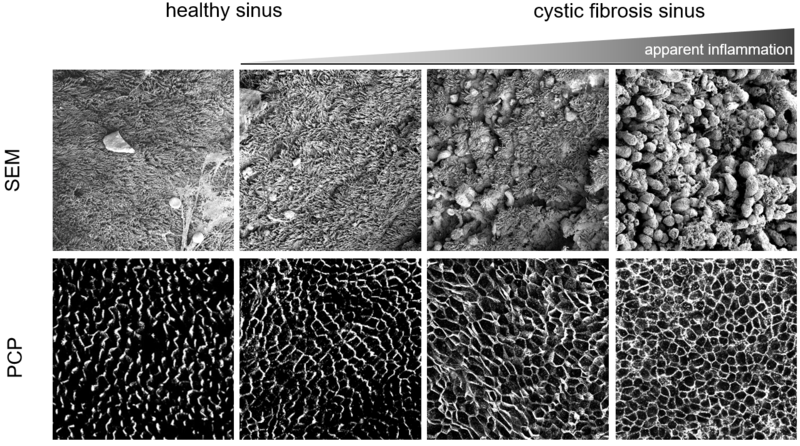 Airway epithelial integrity is constantly challenged, necessitating robust barrier function and regenerative response. However, in diseases such as CF, asthma and COPD unresolved inflammation and cycles of injury and abnormal repair lead to detrimental structural and functional changes (termed remodeling), including the damage or loss of multiciliated cells. We showed that PCP depends on multiciliated cells specification: signaling commences, but dissipates without multiciliated cells. Accordingly, we found that PCP is defective in chronically inflamed human airway disease tissues where multiciliated cells are abnormal or depleted. Exploring airway PCP more widely, we demonstrated that it also controls epithelial regeneration and junctional integrity. Our work suggests a model where multiciliated cell defects in diseased tissues lead to aberrant PCP signaling, which contributes to the loss of epithelial integrity and regeneration and may drive disease progression. Importantly, pharmacological treatment of patient-derived cultures that restores multiciliated cells also restores PCP and improves epithelial function. Thus, we use human samples, mice and cell culture to characterize the PCP defect in airway disease with the aim of exploring future therapeutic avenues.